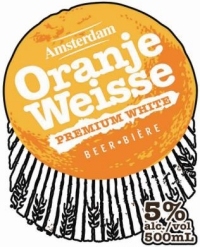 TORONTO, ON – After a successful run last year, Amsterdam Brewing has brought back Oranje Weisse as their seasonal beer for summer 2010. Despite the name suggesting it to be a German-style weissbier, Oranje Weisse is actually closer to the Belgian-style witbier, as it is an unfiltered wheat beer brewed using coriander and two types of orange peel. Amsterdam Oranje Weisse is available now on tap at select bars and restaurants around Toronto, and in a limited run of 120 cases of 500 ml bottles available only at the brewery retail store.